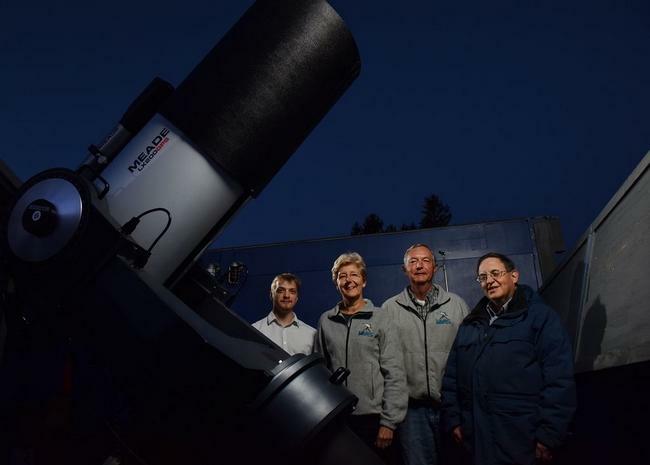 Caption: Mark DiOrio / Observer-Dispatch From left, Zach Handzel, Carol and Chuck Higgins, and Joel Seif of the Mohawk Valley Astronomical Society, stand with a Meade 16-inch telescope at the Barton-Brown Observatory at the Waterville Public Library, May 17, 2016 in Waterville, N.Y. The club was formed in 1989 by a group of seven amateur astronomers at Hamilton College. The group would have its first public meeting July 12 of that year. It was an article published in the O-D previewing that first meeting that enticed Joel Seif, the club’s current president. Now, volunteering members meet on the second Wednesday of every month for a two-part session — about an hour of presenting, and then an hour of club business. The public is welcome to those meetings at the Waterville Public Library.